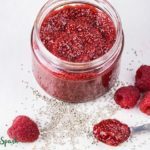 This 4 ingredients Raspberry Chia Seed Jam is ready in 10 minutes, and it’s absolutely delicious. 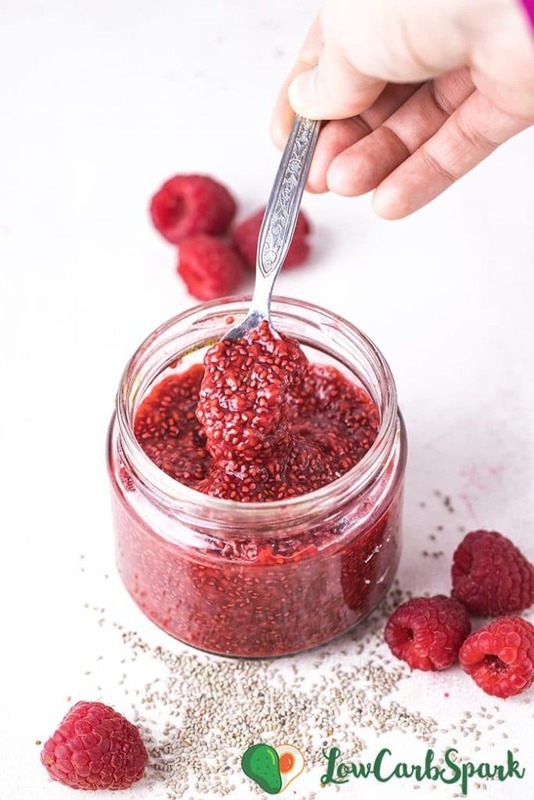 Try this super easy, healthy, sugar-free and low carb jam that’s thickened with chia seeds instead of sugar. To make a fantastic paleo chia seed jam, you’ll need a few simple ingredients. 2 cups fresh or frozen berries – I use raspberries because they are very low in carbs and taste great, but you can use any of your favorite berries. 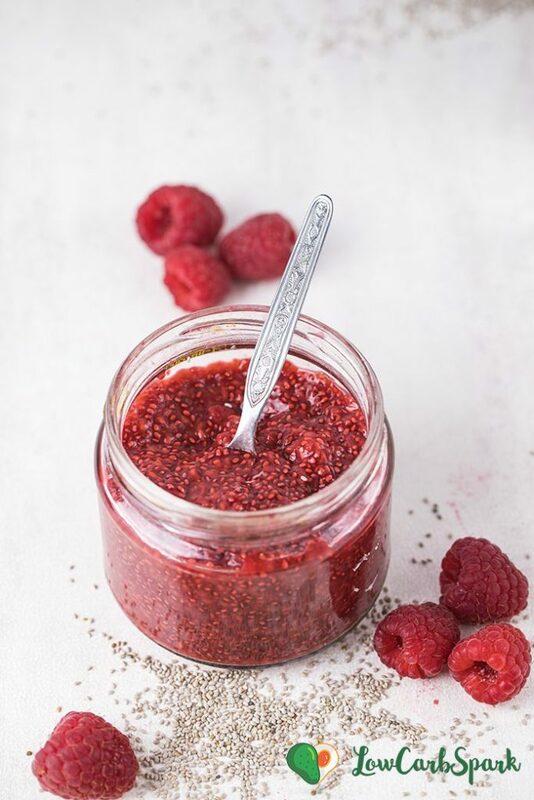 2-3 tablespoons chia seeds – These nutrient-packed seed act like a thickener in this recipe transforming the fruits into jam almost instantly. 2-3 tablespoons Erythritol – Use more or less sweetener depending on how sweet you’d like the jam to be. How do you make chia seed jam? Measure 2 cups of raspberries. You can use fresh if they are in season or frozen, the result will be the same. Add the fruits to a saucepan over medium-high heat. Once the fruits begin to warm up, they will start to break down into pieces and look like a puree. Stir constantly for about 3-4 minutes and then remove from the heat. Stir in the chia seeds, sweetener, and lemon juice and stir well to combine. The sugar-free jam will begin to thicken once it cools down. Let it sit for 5-10 minutes and enjoy. Store the chia jam into an airtight container for up to one week. 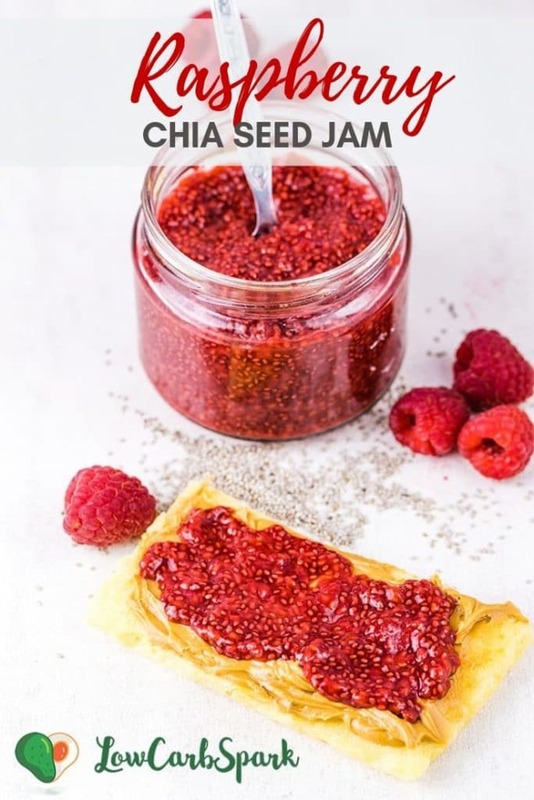 How to serve chia jam? You can enjoy this low carb jam on your keto bread with peanut butter, in a granola parfait with greek yogurt, or as a keto pancake topping. The options are endless, the chia jam pairs perfectly with anything. Add 2 cups of fresh or frozen raspberries to a saucepan over medium-high heat. Stir constantly for about 3-4 minutes until the raspberries turn into a paste. Remove from the heat. Stir in the chia seeds, sweetener, and lemon juice and stir well to combine. The taste, and add more sweetener if needed. Let it rest for 5 minutes to thicken then serve. Enjoy! 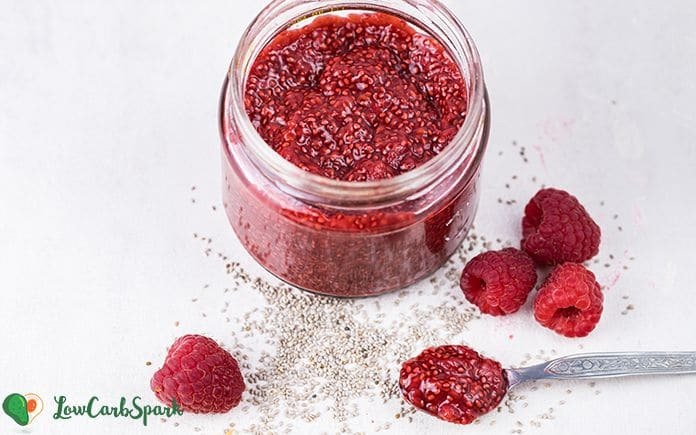 Store the chia jam for up to one week in the refrigerator in an airtight container. What fruits to use in the chia jam? Any low carb juicy fruits such as berries: strawberries, blueberries, blackberries, raspberries. This will also work well with pineapple, apricots, plum or kiwis.